FORT LANGLEY, The WATERFRONT at BEDFORD LANDING! Sunny South facing open concept, 2 bed, 2 bath home. Over 900 sq.ft. 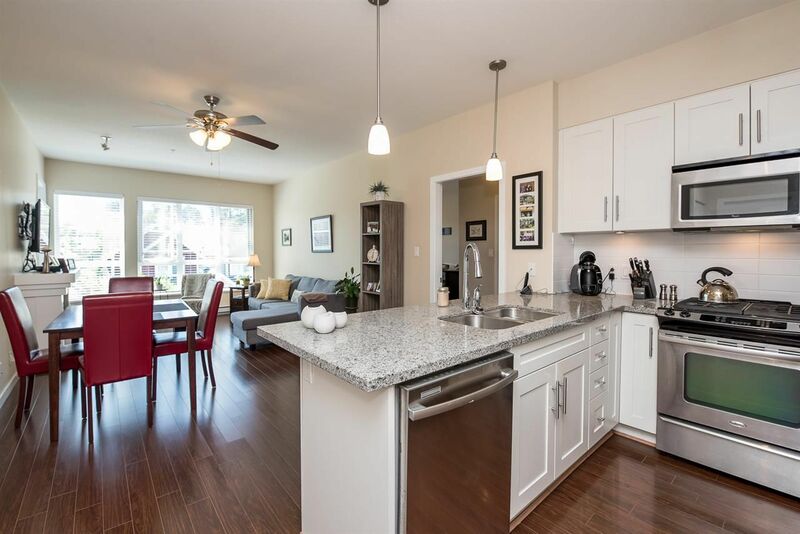 of living space w/9' ceilings, granite countertops, island with undermount sink, S/S appliances, full size front load washer/dryer & wide plank laminate floors. Both bedrooms w/ensuites & new carpet plus on opposite sides. Large master retreat (will fit king size bed) w/WIC, spacious ensuite w/granite vanity & 2 undermount sinks, heated tile floors & glass shower. Secured underground parking, storage locker located on your floor, fitness centre & bike storage. Adult style 45+ living & pets welcome. Short walk to Historical Fort Langley, Fort to Fort Trail, shops, restaurants, cafes. Call today!